Don’t Screen Yourself Out. Let Us Screen You In! Call 810-232-2228 for more information! 1. Contact the FHEO Program at 810-232-2228 with your questions and to sign up for the next information session. 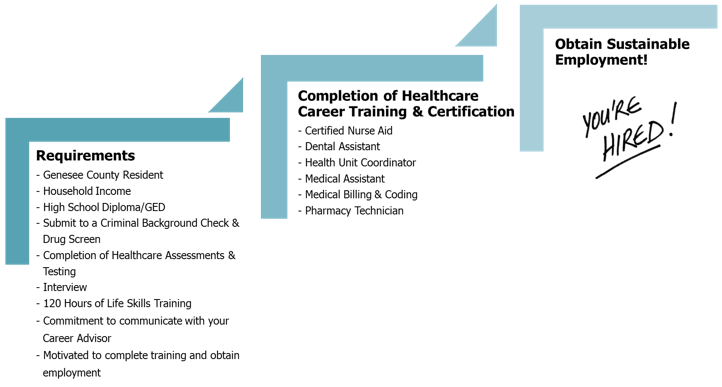 Program components are designed by FHEO Program employers to give participants the background, skills, and experience needed to succeed in a health care career. The Flint Healthcare Education Opportunities (FHEO) Program has been identified by GST Michigan Works! Agency as the lead healthcare service provider for the Workforce Innovation Opportunity Act (WIOA) Career Services (Adult and Dislocated Workers Program) and WIOA Out-of-School Youth Services. The Greater Flint Health Coalition (GFHC) is the lead agency for the Flint Healthcare Employment Opportunities (FHEO) Program and the lead Healthcare Service Provider for GST Michigan Works. Established in 2002, the FHEO Program trained its first graduating class in January 2003. Started thanks to the vision of the Charles Stewart Mott Foundation, the FHEO Program has received funding from the C.S. Mott Foundation, Community Foundation of Greater Flint, GST Michigan Works, the Aspen Institute, and the United States Department of Labor.